Educating our clients and being involved in the community is important to River View Veterinary Service. At the River View Veterinary Service, we are committed to quality, practical education, both for the staff and for our clients. We have several exciting events for our clients and the community that are held annually! From preschool to high school, boy scout or girl scout troops, we are always excited to do tours or group talks! We also are involved in a variety of different types of career fairs and events with local groups. If you have a group that would like to know more, please contact us at 309.848.9093 or email us at rvvscustomerservice@gmail.com! Do you love animals? Have you ever wondered what it would be like to be a veterinarian? If so, then this is the camp for you! Join us for a week of learning and hands-on activities to gain insight on what veterinarians do every day. Activities will include learning about search and rescue animals and special presentations from AAVENGE! 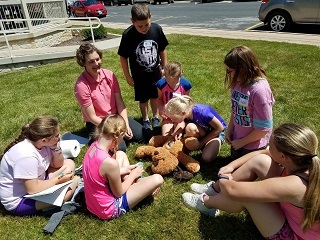 Stuffed animals (and some live ones) will be your patients all week as you go into the lab and treatment area of the hospital, observing the veterinarians as they work, and using some of the equipment! Each camper will receive a River View Veterinary Service “Veterinarian Camp” T-shirt! Space is limited* so sign up by printing off and filling out our Release and Informational Form and emailing it to Dr. Sarah at customerservice@riverviewvets.com or calling 309.848.9093! Registration closes on April 30th! *Preference given to those that have not attended before and current clients. In this short, winter evening course, we will help you identify calving problems and learn how to solve them. At our Calving School, we focus on common obstetrical issues faced by producers. Our goal is to teach how to identify a problem and what can be done to fix it. We talk about everything from a normal delivery to cesarean sections. We will also discuss cow and calf care around calving time. A hands-on lab portion allows you to visualize and hone necessary OB skills, while in a relaxed environment. For more information, view our Calving School brochure or call 309.848.9093! In this short, spring evening course, we will help you discover ways to improve your herd through various reproductive strategies. At our Artificial Insemination (AI) School, we focus on more than just AI. We discuss a variety of synchronization protocols and the benefits and drawbacks of each. We work with individuals in attendance to find the best protocol for their herd. 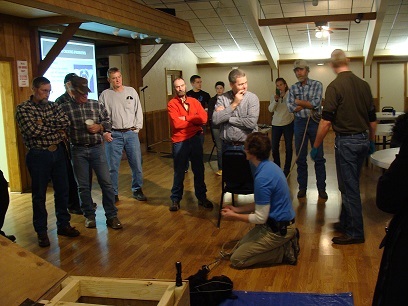 Those that are interested in artificial insemination (AI) can practice their technique with a hands-on demonstration following the lecture. For more information, view our Breeding and AI School brochure or call 309.848.9093!